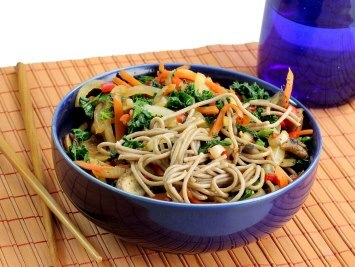 This soba noodle salad recipe has a wonderful vinaigrette filled with delicious Asian flavors. Soba noodles are Japanese noodles made with buckwheat flour or a combination of buckwheat and wheat flours. If you need gluten free noodles make sure the ones you buy are made with buckwheat flour only. I know the word buckwheat sounds like it has wheat in it, but it’s a completely different grain and totally gluten free. Buckwheat flour is heart healthy and rich in phytonutrients so these noodles are quite good for you. They look a bit different being a gray brown color, but they have a wonderful nutty taste. I think you will love this healthy salad recipe. If you are a meat eater and want to make this noodle salad into a full meal, look below the recipe for our steak salad variation. Cook noodles in a large pot of boiling salted water for 6 to 8 minutes or until just tender. Be careful to not overcook the noodles. Drain and rinse under cold running water to cool. Place in a large bowl. Heat 1 1/2 teaspoons of oil in a large nonstick skillet over medium-high heat until hot. Add the mushrooms, onions, carrots and peppers and cook for five minutes or until tender. Place in the bowl with the noodles. To the same skillet add the spinach and water. Cook for one to two minutes or until the spinach is just wilted, stirring constantly. Add the spinach to the bowl. Cook the bok choy, adding a little more water if necessary, for 2 to 3 minutes or until barely tender. Add the bok choy to the noodles and toss to combine. In a medium bowl, whisk together all the vinaigrette ingredients. Pour over the salad and toss it all together well to combine. I just love dark or toasted sesame oil. I has a fantastic rich and nutty flavor and a little goes a long way. If you are new to using sesame oil, start out with a smaller amount and see how you like the flavor. Add more to really get the most from this lovely oil. Be careful with it though. As I said, a little really does go a long way and you can easily overdo it. I wouldn’t add more than what the recipe calls for. To “shave” the carrots I just use a vegetable peeler and cut the carrots into thin strips with it. Place the steaks in a single layer in a shallow dish. In a small bowl, whisk together 1/3 cup teriyaki sauce, 1 teaspoon of the vegetable oil and 1/2 teaspoon of the chili sauce. Pour this mixture evenly over the steaks. Cover and refrigerate for at least three hours or up to 24 hours. Heat a nonstick grill pan or large cast-iron skillet over medium heat until hot. Brush the pan with the remaining 2 teaspoons of oil. Remove the steak from the marinade and discard the marinade. Place the steak on the grill pan and cook for 8 to 10 minutes for medium rare or until desired doneness, turning once. Place the steaks on a cutting board and let them stand for five minutes to rest before cutting them. Cut across the grain and into 1/4 inch thick slices. Arrange the steak over the salad and drizzle with any accumulated carving juices. I hope you love this easy recipe as much as I do. If you do, please take a moment to Pin it to Pinterest, Tweet about it, Like it on Facebook and leave a comment below. Thanks a lot. This soba noodle salad is just one of our delicious Asian recipes. Find them all here.